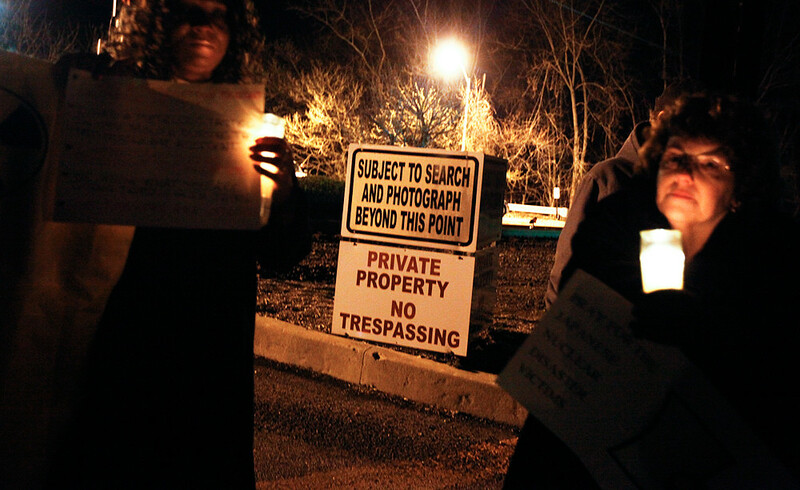 Thanks to a tip I got from a Washington Post photographer whom I’ve long admired (more on that in an upcoming post), I left my apartment at 1:15 a.m. today to cover the 32nd annual Three Mile Island vigil. © 2011 by The York Dispatch. 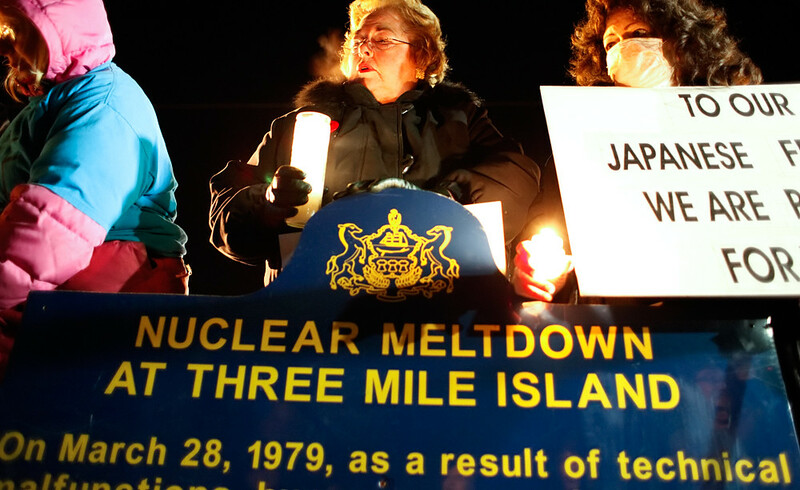 Joyce Corradi, center, of Middletown, and Paula Kinney of Hampden Township prop up a sign describing the Three Mile Island partial core nuclear meltdown, during a vigil marking the accident's 32nd anniversary outside the nuclear plant's Unit 1 on Monday, March 28, 2011. Kinney said after the accident, she and her family moved 20 miles upwind to avoid the spread of nuclear particles. © 2011 by The York Dispatch. Paper cranes, votive candles and sunflowers lined the feet of those who came to the annual Three Mile Island vigil outside the nuclear plant's Unit 1 on Monday, March 28, 2011. About two dozen people gathered the vigil in remembrance of the plant's second unit meltdown 32 years ago on March 28, 1979. 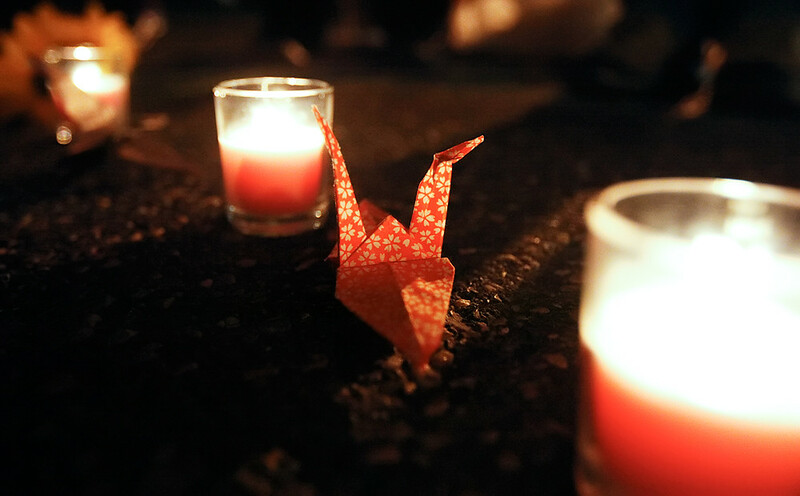 This year's vigil was dedicated to the victims and survivors of the ongoing Fukushima nuclear plant crisis in Japan. © 2011 by The York Dispatch. 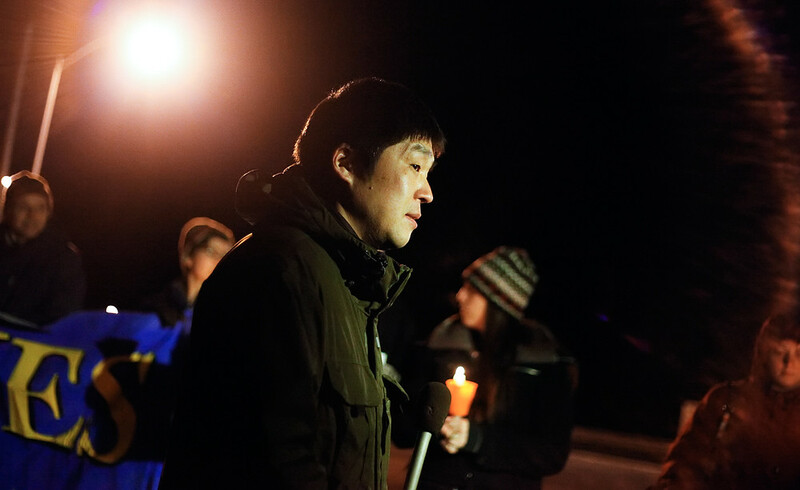 NHK Japanese Broadcasting Corporation reporter Ichiro Kabasawa files a report on Monday, March 28, 2011, from the annual vigil held outside of Three Mile Island in remembrance of the plant's second unit meltdown 32 years ago. NHK was one of several Japanese news crews at the event, in addition to local media. …who made sure nobody crossed the nuclear plant’s property line. On the surface, it was similar to many vigils I’ve covered. A few people spoke out against nuclear power and the powers that be. There were plenty of media, and there were plenty of candles and signs. Yet, covering this particular vigil was a little strange to me. Whereas other vigils I covered were for fairly recent events — the Virginia Tech shootings, 9/11, etc. — the Three Mile Island meltdown was something I learned about in history books. I wasn’t alive when it happened. But it’s something that’s still very real to people in this area, and my realization that this paragraph in my history textbook has remained a hot topic was a startling one. © 2011 by The York Dispatch. 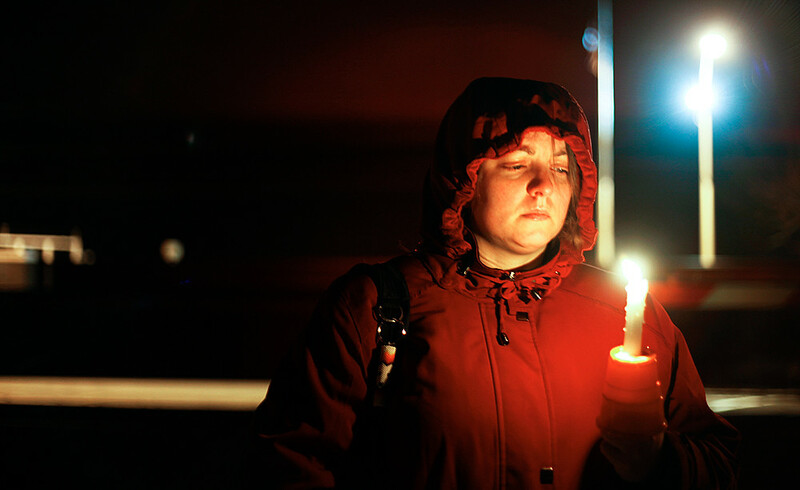 Angie Binick of Hanover holds her candle steady as a train rushes on the tracks behind her and others who gathered on Monday, March 28, 2011, outside of Three Mile Island for an annual vigil in remembrance of the plant's second unit meltdown 32 years ago. Coming up next soon: A (very) long chat with the aforementioned Washington Post photographer, Michael Williamson — a chat that took place over orange juice and peanut-butter-and-banana sandwiches.